Juices and smoothies are a fantastic way of boosting the intake of nutrients into your diet. I like to think of them as nutrient vehicles. This excerpt is from Juice + Nourish: 100 Refreshing Juices and Smoothies to Promote Health, Energy, and Beauty by Rosemary Ferguson, © 2015. Reprinted by permission of the publisher, The Experiment. Photo at top by Nassima Rothacker. Available wherever books are sold. Raw fruit and vegetables, nuts and seeds are a big part of my diet. The thinking behind eating raw is that when food is cooked, some of the nutrient values are diminished. By juicing or making a smoothie with raw ingredients, the enzymes and other phytochemicals stay intact, and the micronutrients—such as vitamins, minerals, enzymes, and phytonutrients—are preserved in a higher concentration, giving you a more nutrient-dense food. The amount of fruit and vegetables you can pack into a juice means you could get your “5-a-day” in a single glass! Many of today’s chronic conditions such as inflammation, irritable bowel syndrome (IBS), bad skin, and lethargy can be signs of a digestive system that is in trouble. The gut is our tank, where we put the fuel to run our body. It is where absorption of the nutrients that make us work happens, and if it is under par, then we feel under par. 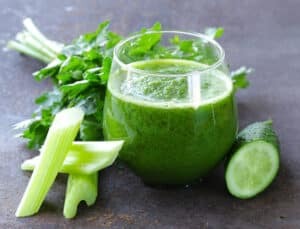 Juices can include specific nutrients that are aimed at healing the gut and making it work more efficiently, nutrients such as glutamine, which is fantastic for inflamed stomachs and wonderfully soothing, and is found in cabbage. 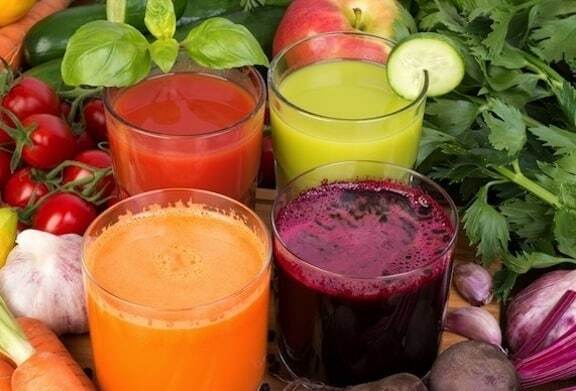 Not only do juices help resolve problems on the inside, but you will see the benefits on the outside too—glowing skin and bright eyes—while feeling more energetic and vital. Juice fasting gives the digestive tract a rest and a chance to cleanse the bowel. To help you do this, I have included detox plans for 1, 2, and 3 days. 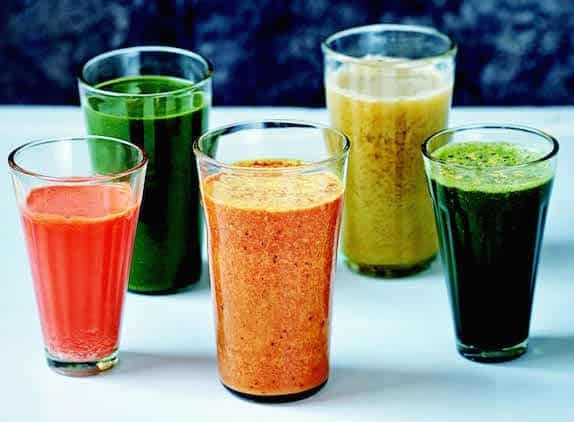 Chewing, eating, and digesting food uses a huge amount of energy every day, so by taking a break and drinking nutrient-rich juices and smoothies for a day or three, you can free up energy for your body to heal other issues. Both juices and smoothies are alkalizing to the body. The Western diet and stressful lifestyles are very acid forming, creating a condition called acidosis in the body. This is when the pH becomes overly acid and it can wreak havoc in the body, causing premature aging, eczema, mood swings, psoriasis, and fatigue—the list goes on. The body works really hard keeping an alkaline state, so giving it a helping hand by regular juicing and increasing cleaner foods is important. Reducing dairy, red meats, processed foods, alcohol, and coffee and eating a more vegetarian, vegan diet, high in fruits, vegetables, and whole foods, encourages a better acid/alkaline balance. Here are more recipes and tips for enjoying juicing.